Overview : Store your save game data on internal RAM. Make and play backups of your original games. Quality/Usability : Let me start of by stating that even though this is MK6 (MagicKey 6), this is not a successor of the MK5 that we reviewed a couple months back. This is just a Slot-1 PassMe device which allows you to store your save game data on to its internal RAM. The NEO3 (Slot-2; for SD or TF) allows you to make and play backups of your original games. We also want to note that we do NOT condone piracy. 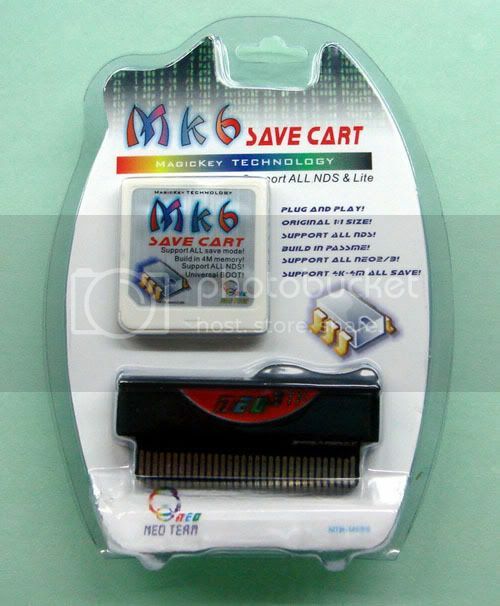 The MK6 is just a simple cart design. The top has a groove as if there was a slot for a microSD but was blocked. The NEO3 looks weird. The top half has a plastic shell while the contacts is gutted and left out naked. Also, the top of the NEO3 sticks out slight from the cart as this is where the microSD is inserted. What I like about this, is that the slot is spring loaded. What I also noticed on the NEO3 cart is that on the bottom of the casing, where it begins to show the contacts, there is an opening on the plastic casing with the bottom part of the microSD slot sticking out. Couldnt they have added a millimeter or two, to the plastic to cover that up? Included is a MK6 Save Cart, NEO3 TF and a miniCD. The miniCD contains all the required files needed but its best to get the latest files from NeoFlash as the files on the CD may be outdated. As for the NEO3, there are two versions. There is a TF which accepts microSD and SD version, which well...accepts SD cards. The NEO3 will need to be setup in order for things to work. To setup the NEO3, you'll need to insert a microSD into the NEO3 and copy the latest version of "_boot_ds.nds" to the root of the microSD. As mentioned above, you can get this from the miniCD provided with the MK6/NEO3 or you can get the latest files from NeoFlash. NEO3 wouldnt be a good choice to play backups even though it can backup your original games. Yes, it sounds contradicting but its the truth. It lacks and fails in the compatibility field. Homebrew files itself didnt work well either as there was no DLDI patcher. Even using NeoFlash's Homebrew Patcher & Burner Maker, I couldnt get majority of the homebrew to work. Once the NEO3 is setup and you insert the MK6 into the DS and boot it up, this is where things get confusing. You are brought to a menu with options to select a save type (Boot GBA with 4K Save - Button Y; Boot GBA with 512K Save - Button X and Boot GBA with 2M/4M/8M Save - Button A), What do you choose?! No instructions are given. This should of been auto-detected and chosen for you automatically. The menu scrolling is backwards. If you press UP, the menu scrolls down. If you press DOWN, the menu scrolls up. The menu also seems a bit sluggish. In order for the DS games to save, you have to set the save type by pushing the Lor R trigger at the start of the game screen. Once you choose the proper save type, the game will save to the MK6 but will run from the NEO3. To backup your original NDS game, press the X button in the NEO menu. The system will then ask you to insert the original NDS cart and press the A button (OK) to continue. It will then start to dump your DS game onto the NEO3. Depending on game size, it takes about 5-8mins. Once completely dumped, swap the original DS game and place in the MK6. Press A and the game will begin to load. Having tested a couple of my games, I had no problems with any of the dumps. Conclusion : Overall, the NeoFlash MK6 Save Cart & NEO3 TF to me is a waste of cash. I honestly do see a need for this except for dumping your original games, transferring the .nds and placing it onto any other Slot-1 flash carts such as M3 Simply, R4DS, EZ-Flash V or G6DS Real. There was no support for homebrew files as well as lack of instructions. The lack of auto-detecting the type of game saves is a disappointment as well. NeoFlash makes some great products for both the DS and PSP, but this is one product that they should of not released. Guests online: 421. Total online: 423.